Arahne has partnered with PatternDesigns.com, to help weavers access a wide range of new designs at an affordable cost. How is this different from simply going to one of the well known stock image web sites, and buying it from there? Pattern Design offers a monthly subscription for weavers, under very special terms. A weaver can download over 3500 designs as PNG images in 600×600 resolution, already in repeat and with reduced number of colors. So they are immediately usable in a jacquard CAD system: assign a weave to each color, and you are ready to weave. Any design can be used for free during sampling period. 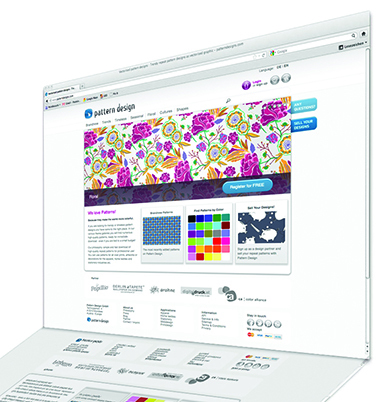 It no longer costs a fortune to create a vast collection of fresh new designs. Once a weaver has the order for a particular design, she needs to actually buy the design. With the purchase of the design, the weaver also gets the image in 2400×2400 pixel resolution, and a vector image in SVG format. All designs are non-exclusive and include unlimited production license. Vector images can be imported in ArahPaint5, and scaled to any resolution without any quality loss, depending on the weaver’s jacquard width. ArahPaint5 is a free jacquard drawing program developed by Arahne, and it can be freely downloaded. It is available for Linux, Windows and Mac OSX operating systems.